I have chosen prompt 11. Radha's Thoughts. Radha's Thoughts: I couldn't even say a proper goodbye to him when he went away to save his biological parents. There wasn't a day I haven't thought about him. The melodious tunes from his flute still make me alive. Then one fine day, I see him again...my Krishna. Disclaimer: This is a work of fiction. Names, characters, events, and incidents are the products of the author's imagination. For recounting the story and building the narrative, I have recreated events, locales, and conversations. In the perspective of an anthropomorphic tendency of our culture, I have attributed human traits, emotions, and interactions with a non-human entity, i.e, God, to portray Him/Her as humans with their myriad emotions expressed in their day to day lives. Mainly, I followed the research we get from Bhagavatham and some other Puranas and Upanishads. This story revolves around Radha and her yearnings for her Krishna. For me, the maiden, i.e, Radha is the protagonist here, who can teach, guide, support and give solace even to God! 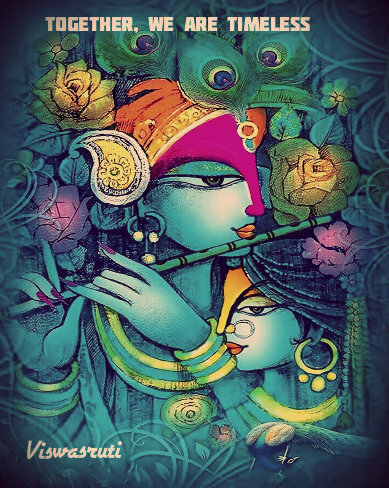 In the following descriptive, I attempted to present my interpretation of the sublime and ethereal love between Radha and Krishna, their passionate bonding and beyond. Radha has been perceived differently by different people down the ages. She was an enigma to the poets as well as the preachers alike. For a few poets, Radha was the adulterous and amorous lover of Krishna and for spiritual leaders, she was his divine consort. This perhaps makes her the most confusing character in Indian mythology. In spite of being older than Krishna by a few years and a wife to someone, she was in deep love with Him! I consider her as an embodiment of love and epitome of selfless devotion in this universe. I tried to define her character from a different perspective, in the light of social, philosophical and of course within the mythological ambit. Her poignant feelings are delineated with an inquisitively different angle! Using a writer's free will and license, I changed the story a bit while presenting the thoughts of Radha in this timeless love saga. Krishna respected each and every woman in his lifetime. Being such a sensitive lover, how could he ever be able to forget or neglect his childhood lover Radha? Not convincingly logical though! I imagine, he maintained the mystic relationship in thought with Radha throughout his life. 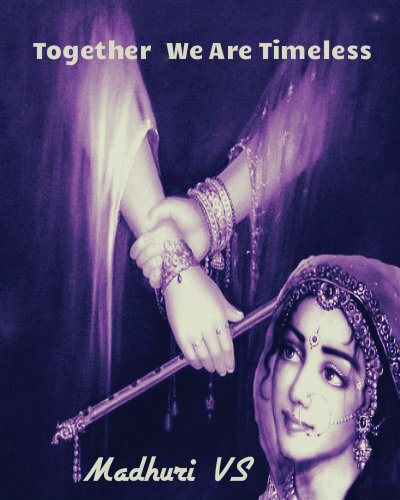 Despite his many wives and passionate and honorable relationship with all of them, what has stood out through ages and centuries is the sublime, undying and metaphysical love for Radha! That underlines the eternal truth of the overpowering and overwhelming influence of Radha's pure love on Krishna's psyche and life. As I imagine, Radha's love was at another level, that resonated in all her hankerings throughout her life. Some of these caged thoughts were there in me, since long, but are finding their way out through this piece of writing; in a way, it is a search within for me, my inquisitive mind is the lighted wisp, my emotional outbursts are my guiding forces and all my learned friends' suggestions are used as constructive instructions. I will have to wait and see how successful I will be in expressing my inner thoughts in this Novelette! Their separation was inevitable. When Krishna left Brindavan, Radha was stranded there in loneliness... desolate and in inconsolable sorrow. All of a sudden, one day, she heard that a chariot was at Nand's front yard and someone came running to her to take her to Nand's house !! My story deals with this angle of her bittersweet musings, her fleeting emotions of angst and ecstasy! The plot will move in line with the vast chronicle of Krishna's life, her longing for him, her yearning and waiting for his return and meanwhile her pangs at the sudden separation. A fresh wave hit that river bank, where a dream was sitting, waiting for that serene dawn of his darshan! A wounded heart will heal in time. When it does, the memories of that distanced one sealed inside would comfort the aching heart! There has not been a single day that Radha has not waited for her Krishna. With every breath that she has drawn, she has taken his name. Slowly, the mist was melting in the late morning rays, like the mystic music spreading its melody over that quivering heart! Love had lost its state and existence because it already transmuted itself into a melodious sway of ragas a heart can sing, just like the melted snow merges into the river and forgets its earlier state! Here love manifested itself as a rainbow in the revelations of Radha who was caught in her swirl of emotions, sitting under the Tamala tree in that meager sunlight which forced its way through the slit of the tree branches...her face was pale and lips twitching ...! "What a sublime peace suffuses this morning, Krishna! When doves murmured on boughs or breeze sighed in sprigs, if waves gurgled in the pond and distant woodwind sounded musical, I was thinking you arrived for me! I looked all around with brimming eyes. Please come once and don't leave me anymore, even for a moment, lest this exultant heart will break!" The cowherd maidens are watching her with suppressed smiles. It's an everyday ritual for them. The flowing water, the swaying waves, the moving breeze with the scent of those floral fragrances, all knew of her love and longing for her Krishna!
" Krishna, your thoughts are paving the stairway to the stars, celestial light beckons me when I see you in front of me, though it is illusory! Is the sky not an illusion but it consists of many stars, Sun, the Moon and many clouds in it? Krishna, come to your Radha once, walking on the path of clouds, or at least smile at me from those glistening river's gentle ripples," she pined ceaselessly! Radha sat there on the river bank seeking peace in solitude. She realized that her Krishna is a King now with many worldly responsibilities. She heard the stories of his association with the Hasthinapur princes, the Pandavas and their changing status day by day. Meanwhile, Krishna fought many battles and expanded the territory of his kingdom. Shifted His base from Mathura to Dwaraka. He was the guiding force to the Yadava clan now ... .showered opulence and wellness to Mathura and Dwaraka people. Chapter 1- His Quest For Her Acceptance. Wow Madi, simply adore this. I am a big fan of your writings and always believe you have a savant's vision! Loved this teaser, so beautifully written and expressed. The imagery, words, narrative combine to form an exquisite whole, cannot wait for the entire story! This is so beautiful and Devine! Your writing is amazing... Its like the time was recreated... Super cool! I know your caliber, waiting to read the next part. I always love your lyrical style of writing.